People often claim that objects, buildings, animals, etc seemed much bigger when viewed as a child than they do now when viewed as an adult. Yet I can’t say that I’ve ever noticed this, personally speaking. Everything that I can recall from childhood and which still exists in unchanged form today looks just the same to me now as it did then – which is why I cannot use this notion as an explanation for the giant mole of Mesty Croft. Between the ages of seven and eleven (i.e. during the late 1960s), I attended Mesty Croft Junior School in Wednesbury, West Midlands, and whereas for many other erstwhile pupils of this fine establishment their abiding memories may well be of childhood classmates or even of teachers whom they liked or disliked, my most tenacious recollection of Mesty Croft is an extraordinary exhibit – one that fascinated me throughout my time there, and which I secretly coveted for what I now realise to be reasons of slowly-awakening cryptozoological awareness. The exhibit was a taxiderm mole, mounted on a wooden plinth, and placed on a shelf beneath a window in the main assembly hall. For a child who hoarded dead insects in matchboxes, enjoyed birdwatching in the countryside at weekends, collected frogspawn and sticklebacks in jam jars, gathered up seashells off the shore on seaside holidays, and visited every major zoo in Britain, it is hardly surprising that I entertained daydreams of owning this wonderful item and displaying it in pride of place in my bedroom. However, thanks to a loving but responsible upbringing by parents who left me in no doubt about the evils of theft and other misdemeanours, a wistful daydream is all it ever remained. It wasn’t until some time after leaving Mesty Croft that I saw other taxiderm moles, and was astonished at how small they were (no more than around 5 inches long at most) in comparison with the example that I had known so well at junior school, and which I now realise was almost as big as a rat in terms of body size (but with only a very short tail). Not only that, their fur was always velvety smooth, whereas the Mesty Croft giant mole’s was decidedly curly and much harsher, as I well remembered from having stroked it on a couple of occasions when walking by its shelf in the assembly hall. Could it be that the latter specimen’s fur had deteriorated over the years since its pelt had originally been prepared by the taxidermist? Yet if so, a more likely outcome would surely have been fur loss, not increased curliness? And how can this mega-mole’s size be explained? 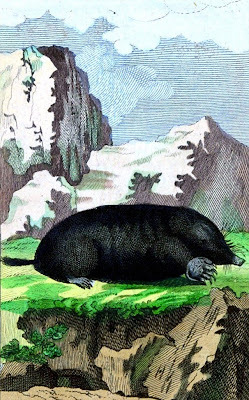 Is it possible that it was not a specimen of the common mole Talpa europaea, but of some much larger, exotic species from outside Europe? Its fur was jet black in colour, whereas that of the common mole is more often dark grey, thus providing further support for the prospect that this was no ordinary British mole. Today, the trail of Mesty Croft’s giant mole is so cold that there seems little hope that it can ever be thawed out. As far as I am aware, none of the teachers who were at Mesty Croft during my time there are still alive; and in less than a decade from when I left, the entire school was razed to the ground and later completely rebuilt in a totally new layout. So whatever happened to its mole of mystery? Was it simply discarded during this major upheaval, or did someone rescue it from such a cruel fate, so that somewhere out there it may still exist today - preserved in scientific anonymity, perhaps, on someone’s windowsill, bookshelf, or mantelpiece? I appreciate that it is a very remote possibility, but if there is anyone reading this who can shed any light on the very curious case of the long-lost giant mole that once resided proudly on a shelf in Mesty Croft Junior School, Wednesbury, West Midlands, I’d very much like to hear from you. 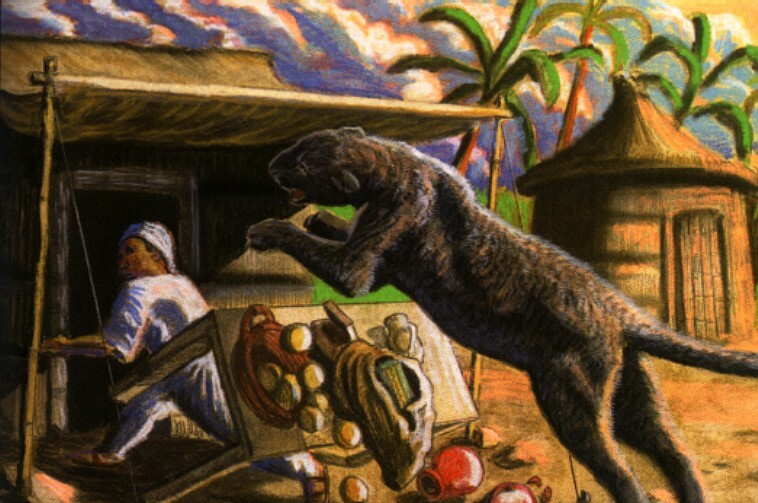 There is an old, traditional Tanzanian folktale that tells of the Sultan Majnun's youngest son who went seeking a murderous feline monster called the nunda, which had killed his three brothers and many other hapless humans too. Evidently not the most zoologically-knowledgeable of people, he proceeded to kill several different animals, including a zebra, a rhinoceros, an elephant, a civet, and a giraffe, each time mistakenly assuming that this must be the nunda. Eventually, however, he encountered the real nunda, lying asleep under the shade of a tree. As large as a donkey, with distinctive brindled fur, huge claws, and enormous teeth, it was a terrifying sight, but the Sultan's son slew it as it slept, and returned home in triumph, having rid his father's kingdom of this malevolent scourge. Reminiscent of the dragon-slaying tales popular in Europe, this is a quaint story - or it would be, if that indeed was all that it was. During the early 1920s and again in the 1930s, however, while acting as Native Magistrate at a small Tanzanian coastal village called Lindi, Captain William Hichens had good reason to think otherwise. 'Nunda' in Swahili translates as 'strange one', and according to the people of Lindi and elsewhere along the seaward edge of Tanzania, the feline monster of the above folk tale is no myth. Also known to them as the mngwa, and said to inhabit this country's temperate coastal forests, they readily distinguish it from both the lion and the leopard - the two known species of big cat inhabiting this region of Africa. Its footprints are very characteristic, resembling a leopard's in shape, but as large as a lion's. The nunda itself is also said to be as big as the biggest lions, with unmistakable greyish fur striped with tabby-like markings. "It was the custom for native traders to leave their belongings in the village market every night, ready for the morning's trade; and to prevent theft and also to stop stray natives sleeping in the market-place, an askari or native constable took it in turns with two others to guard the market on a four-hour watch. Going to relieve the midnight watch, an oncoming native constable one night found his comrade missing. After a search he discovered him, terribly mutilated, underneath a stall. The man ran to his European officer, who went with me at once to the market. We found it obvious that the askari had been attacked and killed by some animal - a lion, it seemed. In the victim's hand was clenched a matted mass of greyish hair, such as would come out of a lion's mane were it grasped and torn in a violent fight. But in many years no lion had been known to come into the town." Hichens was both shocked and greatly perplexed - but the people of Lindi were neither. They assured him that it was the work of a nunda, and an old native governor of the district confirmed that a nunda had carried out several other attacks here in the past. 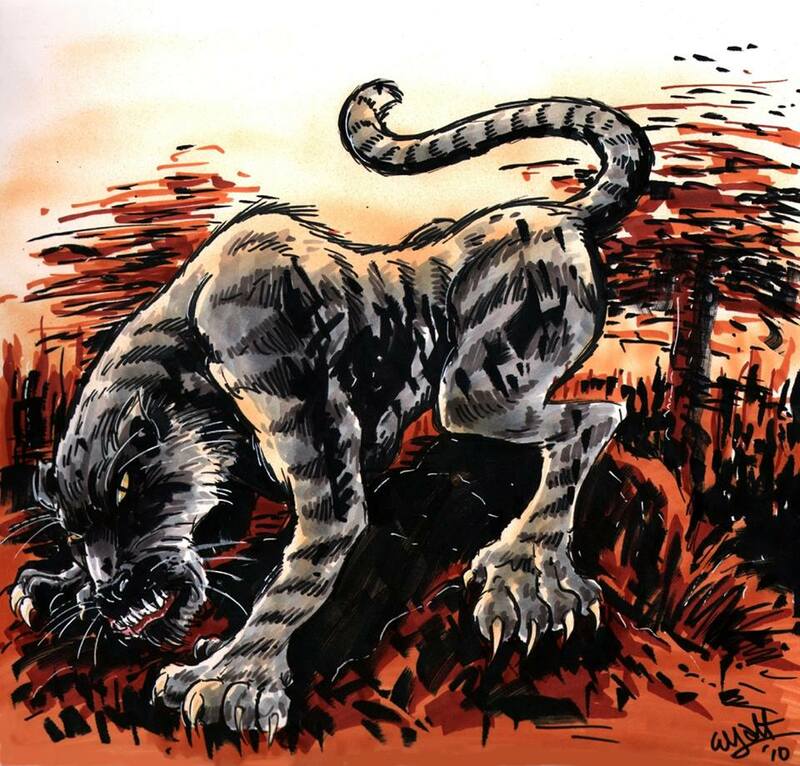 Moreover, shortly afterwards two men informed Hichens that they had been passing by the market on the night in question, and had been horrified to see an enormous brindled cat leap out of the shadows and pounce upon the unfortunate askari. But that was not the end of the matter. A couple of nights later, a second askari met his death in the same manner, and in one of his clenched fists was found more of the strange, brindled grey fur. Over the next month, several further killings took place up and down the coast, but despite the local police force's best efforts, the perpetrator was never caught. During the 1930s, however, another, identical series of killings occurred in Hichens's district. One lucky survivor was an old, extremely experienced hunter, to whom lions and leopards were very familiar beasts. He stated adamantly that his attacker had been neither of these, but had instead been a nunda. Apart from Hichens, another Westerner with experience of the nunda was Patrick Bowen, who obtained some fur left behind by this feline assassin after it had made off with a human victim. He also observed its footprints, which were indeed huge. So what could it be? "...witch doctors in the Singida area, in what was at that time Tanganyika [now Tanzania], ran a lucrative extortion business in the early twentieth century by threatening to turn themselves into lions and kill people who did not pay them. Many people were murdered by young men dressed as lions, wearing lion paws as gloves on their hands and feet. These mjobo, or "lion men," reappeared in the same area in 1946, some twenty-five years later, and 103 deaths were attributed to their activities. Murders were made to look like the work of man-killing lions, and the common belief in were-lions was exploited by secret societies." Could it be that the Lindi killings were also the work of these lion men? The timings are similar – two separate outbreaks, one during the early 20th Century and a second over a decade later. Claims that the killings resembled maulings from some great cat are also consistent with this theory, and what better way to increase fear among the highly superstitious local people than to spread rumours that the assailant was not even a lion but rather a greatly-feared mythical feline monster – the nunda? And to provide physical evidence for this claim, what easier way than to place clumps of grey fur in the hands of the murder victims, fur that was clearly not from a lion but matched the folklore descriptions of the nunda? 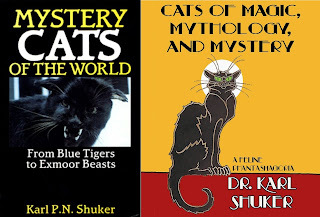 In reality, of course, the fur could have originated from anything, even a domestic dog, but as long as it didn't look like a lion's and did look like the fabled nunda's, that was all that was required of it. Even the extra-large footprints would not be beyond the ingenuity of the lion-men to fake, thereby yielding further evidence of nunda presence in the eyes of the frightened locals. Consequently, although I don't entirely deny the reality of the nunda, I do consider this particular explanation the most plausible for the two outbreaks of nunda-attributed Lindi killings. Assuming that the nunda does indeed exist, however, three other options exist. Firstly, it may conceivably be a wholly unknown species, lurking undetected by science amid Tanzania's dense forests. Secondly, it could be an exceptionally large form of aberrantly-patterned leopard. Striped leopards have been recorded in the past, and the nunda's footprints do resemble a leopard's, except for their larger size. Having said that, however, the concept of a ferocious lion-sized leopard is not a very comforting one, to say the least! Thirdly, and perhaps most intriguing of all, is the identity put forward by veteran cryptozoologist Dr Bernard Heuvelmans. He has suggested that the nunda may be an undiscovered giant version of the African golden cat Caracal (=Profelis) aurata. 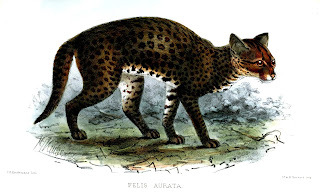 Normally measuring up to 4.5 ft in total length, and native to East as well as West Africa, this is not only one of Africa's most elusive but also one of its most morphologically versatile species of cat. Its pelage can vary in colour from gold, through a wide range of reds, browns, and greys, to a melanistic all-black form, and superimposed upon this diverse range of background colours there can sometimes be an equally broad spectrum of dark spotted patterns too. Consequently, as argued by Heuvelmans, of all the known feline species native to Africa, it is the golden cat that offers the greatest likelihood of yielding the brindled grey-hued pelage characterising the nunda. In addition, despite being only a medium-sized cat, the golden cat inspires extraordinary fear and tribal superstition throughout its wide distribution range, on account of its extremely savage, bloodthirsty nature. Also of note: eyewitnesses have claimed that despite its huge size, the nunda does not roar like a lion or leopard, but purrs, just like an overgrown domestic cat. And the throat structure of the golden cat is such that it does indeed purr (which lions and leopards cannot), rather than roar. 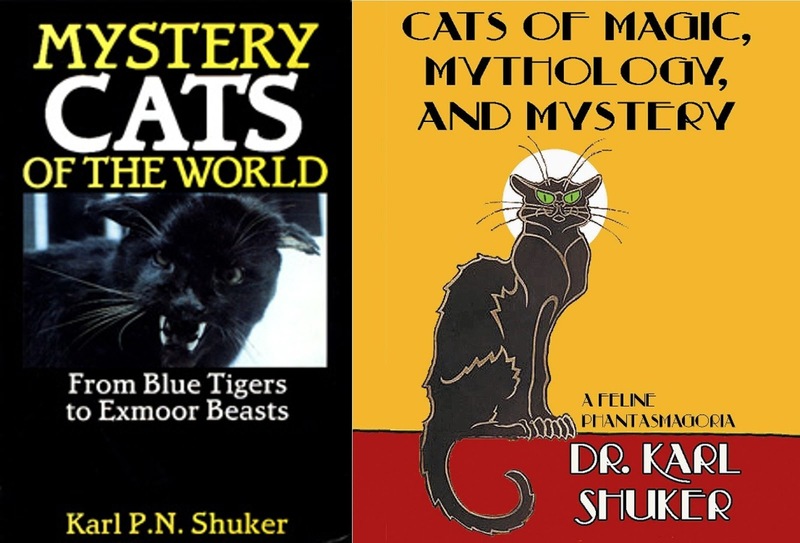 Further information concerning the nunda and other African mystery cats can be found in my books Mystery Cats of the World and Cats of Magic, Mythology, and Mystery. What do you call a newly-found hairless mole-like creature from the Antarctic, with a heat-emitting bony plate on its brow for melting tunnels in the ice beneath unsuspecting penguins, which the creature can then seize and devour? A successful April Fool joke, that's what! The story of the hot-headed naked ice borer, a 6-inch-long surprise recently revealed in the frozen southern continent, was featured in the April 1995 issue of the American science magazine Discover, and even included an impressive photo. Such a distinctive new species naturally attracted a lot of interest, and reports subsequently appeared in several other publications - until June 1995, that is, when Discover's editors triumphantly exposed the ice-borer as a spoof. In the true spirit of the event, however, the original Discover article had contained a quite obvious clue as to the ice-borer's real identity. The name of the wildlife biologist who had supposedly found it was given as Aprile Pazzo - Italian for 'April Fool'! Even at the best of times, cryptozoology is perpetually on the lookout for frauds and hoaxes when assessing reports of mysterious animals. It must always be especially vigilant near the onset of the fourth month, however, because the unveiling of sensational new species is a perennially popular choice for an April Fool spoof. Some of them, moreover, have become classics in their field, like the following example. In spring 1984, London Zoo received a wonderful new animal, which immediately became a popular star - and for good reason. How many animals can you think of that can perfectly mimic their human observers? Yet this remarkable creature, standing upright on its back legs, would wave when the crowd waved, and even clapped its front paws together when the crowd applauded. It resembled a shaggy bear, dark on top with a white chest, white toes, and a long white mandarin-like moustache that drooped down over its cheeks. According to the label on its enclosure, it was from an eastern Himalayan locality a few hundred miles north of Bangladesh, and the local people there called it a lir-pa loof. Zoologically, it was the only known member of a new mammalian family, and had been dubbed Eccevita mimicus. The lir-pa loof generated an incredible amount of public interest. During the first week after its arrival, London Zoo received around 1000 telephone calls from people requesting further information about it, and the Natural History Museum and the BBC were similarly bombarded. When you're as famous as this, there is only one thing to do - make your television debut. And that is precisely what the lir-pa loof did - appearing with its keeper, George Callard, on the popular BBC show 'That's Life', hosted by Esther Rantzen. By now, there were ample clues for exposing the secret of this creature (whose loose-fitting skin could so easily conceal a child or kneeling adult!). Spelled backwards, 'lir-pa loof' becomes 'april fool'. The date of its debut on 'That's Life' was April 1. And for the more classically-minded, the lir-pa loof's generic name, Eccevita, is Latin for 'That's life'. Amazingly, however, there were still a surprising number of people who believed in the lir-pa loof's authenticity - until the very next 'That's Life' show. That featured the second (and final) appearance of this marvellous mammal and its keeper, singing "We apologise". Animal April Fools come in many forms. Some are simple, slapstick fun, like Charlie the 'chickpanzee'. This genetically-engineered miracle combined the DNAs of a chicken and a tamarin monkey, and appeared in London's Daily Mirror newspaper on April 1 1991. More deceptive was George - a vicious crossbreed between a goldfish and a piranha but outwardly resembling true goldfishes. Photographed in the Daily Mail on April 1 1987, George appeared alongside his 12-year-old owner, Amanda Baker - nursing a bandaged finger. People who were not experienced fish fanciers probably didn't realise that piranhas and goldfish are far too distantly related to yield hybrid offspring, but the Daily Mail owned up on April 2 - enabling goldfish owners everywhere to breathe a sigh of relief again at feeding time. On April 1 1989, London's Today newspaper included an amusing spoof concerning the arrival at London Zoo of a living sauropod-type dinosaur from Guinea - clearly inspired by real reports of the mokele-mbembe from the People's Republic of Congo. Also in 1989, the April 1 issue of Garden News featured a front-page special on the astounding germination of a prehistoric plant from fossilised dinosaur droppings. Aptly dubbed the dinosaur vine, it was being studied by Professor Adge Ufult - just say his name outloud! Appropriately, however, the most famous cryptozoological April Fool involved the most famous cryptozoological creature - the Loch Ness monster. On April 1 1972, newspapers worldwide reported the astonishing discovery of a 9-ft-long seal-like beast, weighing over half a ton, that had been found dead at the side of the loch. Soon afterwards, police intercepted a van transporting the body south to Flamingo Zoo Park in Yorkshire. When examined, it was found to be the carcase of a dead bull elephant seal, which had been deep-frozen for several days, giving it a peculiar greenish hue. Its whiskers had been shaved off too, and its cheeks had been stuffed with rocks. On April 2, Flamingo Zoo Park's public relations officer, John Shields, confessed that it was an April Fool hoax, which he had secretly set up as a joke directed at the managing director of the company owning the zoo. Shields had used the body of an elephant seal that had died a week earlier at Dudley Zoo, owned by the same company. Lastly, a modern-day online classic. On 1 April 2008, the nowpublic.com website published a news report by Bill Adler announcing the escape from Washington DC's National Zoo of a particularly rare creature known as the loof lirpa. 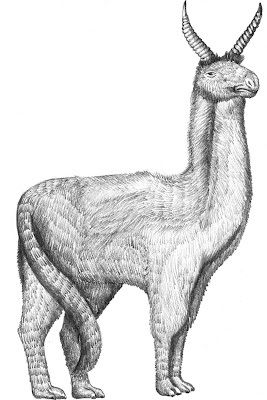 Its photo revealed it to be a llama-like beast but sporting a pair of long slender gazelle-like horns. Native to Patagonia, it is further distinguished by its distinctive odour, likened to cheap cologne, and although usually a mild-mannered species, this particular individual, an adult male, had been ready to mate when it escaped and so may well be feeling aggressive. Needless to say, however, there was no need to be alarmed - as long as you took the trouble to notice which phrase this exotic animal's name spelt out if read backwards!